Why You Should Hire a Pro for Drain Cleaning | Reliance Plumbing Sewer & Drainage, Inc. Chances are, at some time or another you’ve performed a DIY (Do It Yourself) project in order to save money. In some cases, this ends up being an easier and cheaper choice for a project. For instance, panting the inside of your home, or adding a tile backsplash in your kitchen, or even fixing a squeaky door are all examples of tasks you can take on yourself. However, there are also projects that should just be left to the professionals—such as fixing a broken computer, replacing a heavy duty appliance, or doing major plumbing work. Of course, you might not always need a professional plumber in Glenview, IL for your plumbing job. Something like a drain clog can sometimes be relieved with a plunger and a little bit of elbow grease. But this is not always the case. Take a look below while we examine cases in which you should definitely hire a pro for drain cleaning. Most homes are equipped with a plunger. And a plunger is great for some clogs, such as those that are right near the drain opening. It could require a bit of work, but once you’re able to maintain a tight seal in the drain opening and keep constant pressure both up and down, you should be able to loosen it up enough that you can remove it. It typically takes 10-15 pushes to work these clogs out. And to be honest, if you were to call a professional plumber for the job, a plunger may be the first thing they try, since we don’t want to waste your time if there’s an easy solution. However, in many cases it ends up that more powerful tools are required. Plungers may be able to break up minor clogs near the drain opening, but they won’t do much for those clogs that are deep down in your plumbing system, or potentially even in your sewer line. Perhaps you already own a drain snake that includes a small crank to get down into your drain openings. However, if you’ve ever used it then you likely already know it can be hard to latch onto a clog. They often reach a stuck point and it becomes difficult to crank the auger down as much as you need to. But a professional drain snaking tool is different. They’re built tough and can work through essentially any clog. Many are even motorized. 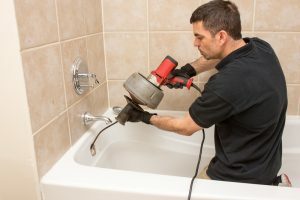 What’s even more important is that our plumbing pros know how to safely and properly use the drain auger for any clog removal, making a professional a much better option for you when you have a clog. But wait, why haven’t we mentioned store-bought drain cleaning solutions yet? You know, those bottles of liquid that claim to effectively get rid of any clog? Well, because they’re ineffective at best, and caustic and damaging your plumbing at worst. The chemicals within them eat away at the clog, but also your piping—and they’re bad for the environment! Our plumbers rely on hydro-jetting equipment. A hydro-jet is a high-pressure water hose that blasts water into your drain pipes—no chemicals involved—which completely scours the lining of the pipes and removes grease and debris. This not only clears existing clogs but makes it harder for blockages to develop in the future, too.